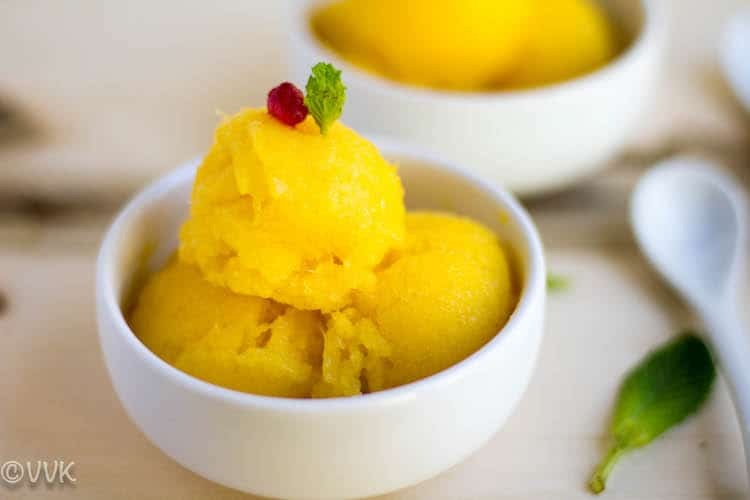 When it comes to frozen delights, Sorbet is a must, and I cannot skip this simple frozen fruit delight during summer. 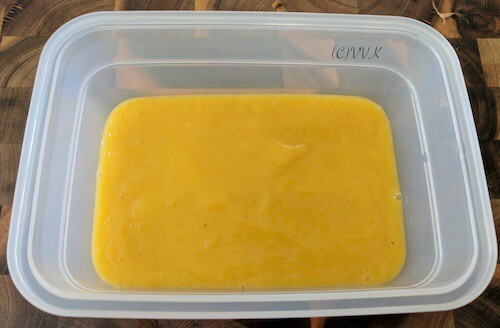 Today I am going to share a Tropical Sorbet, precisely Pineapple and Mango sorbet with a hint of lemon juice. And, I did not use any ice-cream machine or churner for this recipe. Aloha !!! 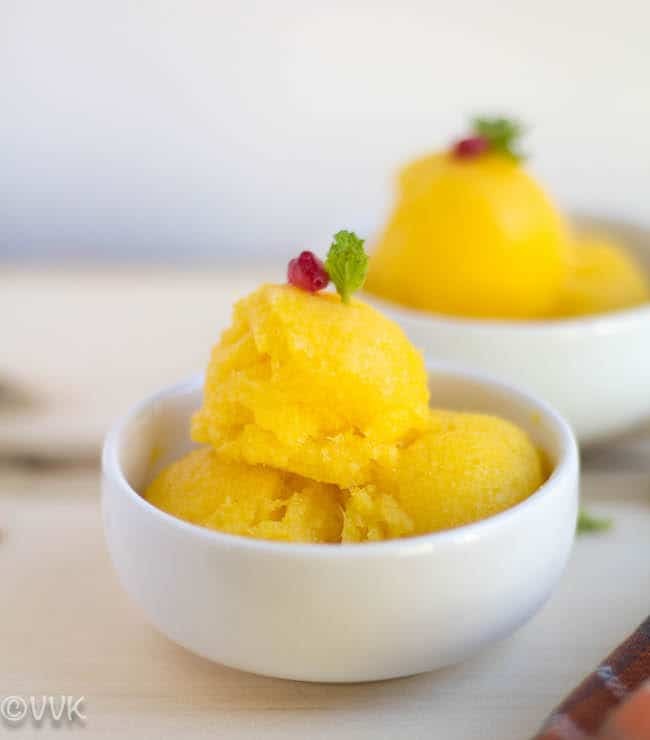 Bring the tropical flavor to your home with this delightful five ingredient no churn sorbet. 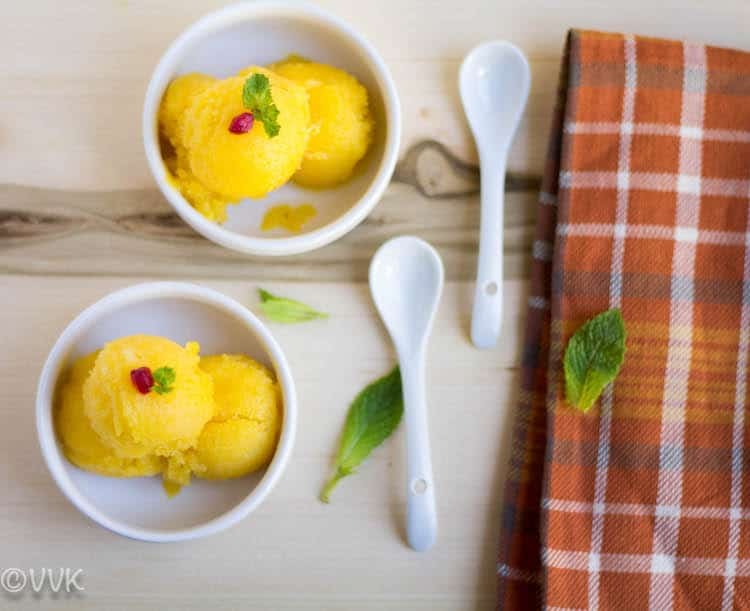 Here is the Mango and Pineapple sorbet recipe with step by step pictures. I have mentioned in my Cheese Danish recipe that kiddo doesn’t prefer the lemon flavor in his desserts. But I wanted to change that as I wanted him to relish the zillion citrus-based desserts. I wanted to incorporate the lemon flavor little by little, and I started off with this dessert. 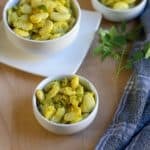 I only added about two tsps of lemon juice, but I would recommend going up to 1 tbsp if your child prefers the lemon/lime flavor. If your pineapple is not sweet and a bit tangy, then play carefully with the lemon juice. It’s always better to check the sweetness of the fruit before preparing any fruit-based desserts. 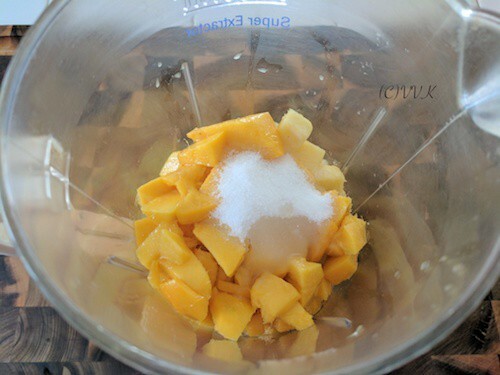 In my case, both my mango and pineapple were super sweet, and with the 3 tbsps of heaped sugar, the lemon juice lifted the sweetness. Also, there is no set measurement for this recipe. I used one small mango and two rings of pineapple which came to this below proportion. But you can always adjust the fruit quantity as per your taste preference. 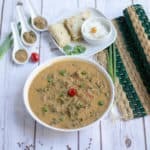 Without any further ado, here comes the recipe. Peel and chop the fruits and set aside the required quantity. Squeeze the lemon juice and set aside two tsps. 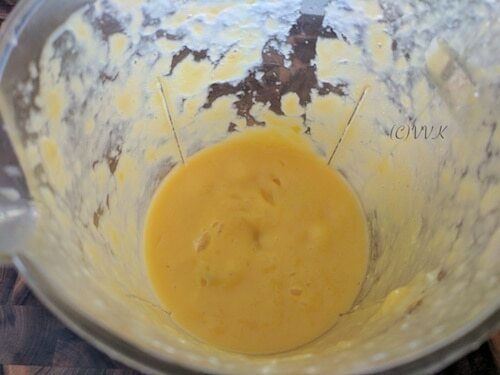 In a blender, add the cut pineapple, mango, lemon juice and sugar. Blend them into a smooth mix. If required, add a little water and puree the same. 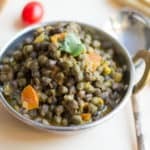 Pour this into a freezer safe container, break the air pockets if any and freeze it at least for 4 to 5 hours or until it is firm. 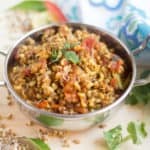 Scoop it out and garnish it with berries or pomegranate arils and mint leaves serve it cold. Freeze the rest. Adjust the sugar according to the fruit sweetness. Make sure the fruit puree is smooth without any chunks. Adjust the fresh fruit and the quantity as per your preference. After adding the fruit puree mix in a freezer safe container, you can cover it with a cling wrap or aluminum foil to avoid freezer burns. Sending this to BM#78. 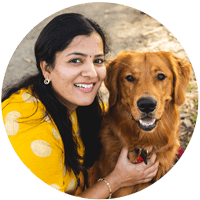 Check out other bloggers doing this marathon and also sending this to Srivalli’s Kid’s Delight event, themed on themed on Frozen Food. 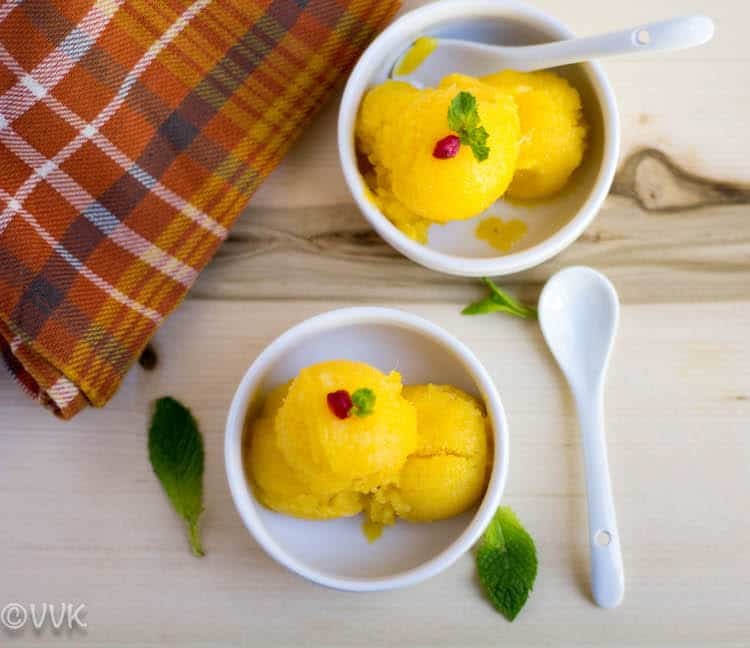 A delightful Tropical no churn diary free sorbet prepared with mango, pineapple, sugar and lemon juice. Sorbet looks super refreshing and do colourful. That looks yummm!!! both are my favorite fruits !!! definitely two very tropical fruits combined… so delicious and tempting. 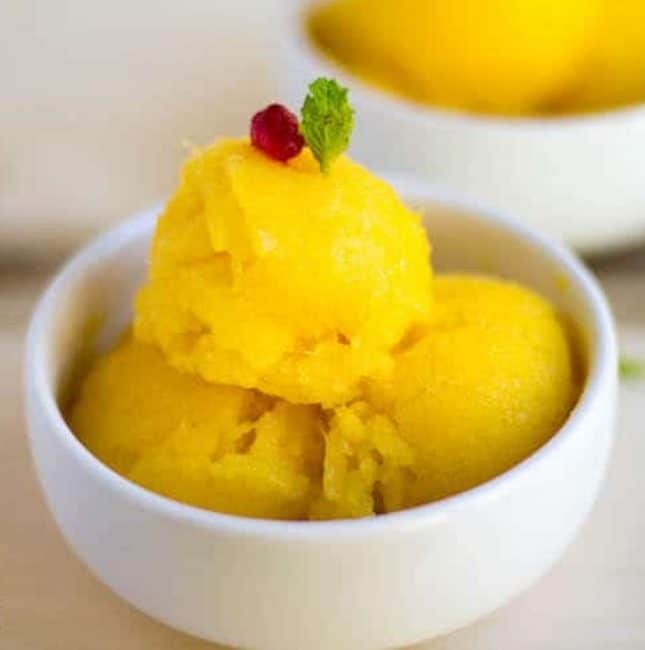 Love tropical fruits specially mango and pineapple.. both r mine fav.. lovely and refrshing sorbet.. good option in summer season. Love the clicks, everything looks so sinful! Looks so pretty! I am yet to try a sorbet at home. 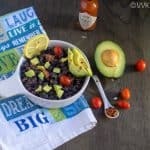 Your recipes is inspiring me to try. My kind of sorbet, so exotic and very refreshing.. Loving it so much.